Crossway intercity bus | TEZAS servis a.s. The CROSSWAY is designed for intercity transportation. It is typical for its quality and proven reliability. 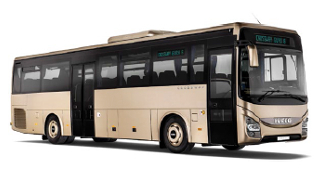 In Europe, it is therefore best selling bus in its class. The model range offers a wide menu which fully meets the requirements for various transportation needs. The CROSSWAY bus is not only practical, but also attractive and optically appealing. Distinctive modern design with simple lines, with extraordinary interior space for convenient travelling, and many sophisticated details. Diversity of the supplied versions. Wide range of seating arrangement options. Capacity up to 61 seats. The CROSSWAY city bus is supplied in three lengths: 10.8, 12 and 13 metres. The available versions will fully satisfy the needs of all future users. For example, the diverse choice of seat arrangements makes the CROSSWAY range the most flexible means of intercity transportation. The LINE version of the CROSSWAY bus is an ideal choice for the public transportation on short and medium distances. It offers a comfortable environment for passengers and drivers. The driver’s position meets the highest ergonomic standards. 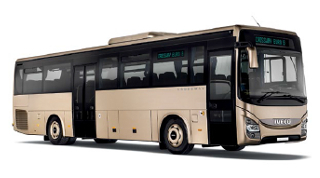 The bus is also designed for maximum safety, low fuel consumption and longer service intervals. Low operating costs and proven reliability – these are the main advantages of the POP version designed especially for school transportation. Other advantages of CROSSWAY POP especially include: easy access, plenty of luggage space, more security systems and practical design of the comfortable interior. CROSSWAY PRO is the ideal solution for bus operators in search for a universal bus, primarily for regional transportation. It boasts its high flexibility, as it offers both the practical features of an intercity bus service and the comfort of a long distance coach. It has successfully combined easy access with modern equipment features, which you can otherwise only find in tourist buses. It therefore guarantees high comfort both in cities and on intercity lines.